Exeter City have launched a bid to bring winger Martin Phillips back to the club from neighbours Torquay. The Grecians want to re-sign Phillips, who started his career at Exeter before spells at Manchester City, Portsmouth and Plymouth. Any deal for the 30-year-old would initially be a loan move until the transfer window reopens in January. 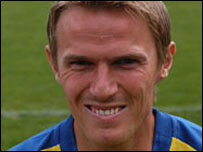 He has made 78 appearances for Torquay since joining the club in July 2004 but has started just 10 games this season.